DESIGN OUR NEXT POETRYPALOOZA LOGO!!!! What is Poetrypalooza? Last year, over 200 visitors attended our one-of-a-kind summer touring event across different venues from East to West Los Angeles for ten days with artists of all art forms. Together, we shared in the experience of live spoken word, workshops, and live music. We expanded our horizons and experience with the diversity of art forms. In addition to the arts, we created strong connections with local and traveling artists and with the people who live in the community so we can all continue to live in and share this tradition. What do we need? Your contribution of artwork, of course! All artwork must be in any of the following formats: JPEG, IMAG, PDF, PNG.The name of the event (Poetrypalooza) must be incorporated in the design. The Contest Winner will have his or her artwork featured on this year's t-shirt, fliers, promotional merchandise, and updated website. Congratulations to Our Poetry Contest Winners!!! You are invited to our POETRYPALOOZA GRAND FINALE this Sunday @ 5P.M. to share your winning poems and redeem your prize now that the secret location has been revealed! The secret address is 1726 S. Vermont Ave. in Los Angeles, CA. You will also have an opportunity to meet some of the judges. Special Thanks to our Poetry Contest judges: Suzanne Lummis, Maryl Jo Fox, Jwanzaa, and Carol Lem. Thanks to all for submitting their guesses! There will be a prize presented at the finale event to the first person who is able to correctly answer all the riddles below. Send your answers to poetrypalooza@gmail.com before Saturday, August 27 11:59PM to win! 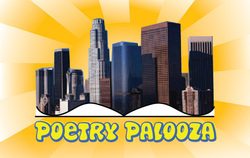 In case you haven't heard, Poetrypalooza 2011 is the first of it's kind 10-day and 10-city poetry festival that has focused on promoting poetry's presence in music, theater and spoken word, and now we are promoting visual artists for our final event. We are sending out an open call to all local visual artists to submit a jpg (or links to your website) to us so we can showcase your art at our finale event. This is a one day grand event with two bands, two performances, poetry contest winner readings, delectable healthy food from Whole Foods Market and more; you will have the unique opportunity to sell and showcase your original artwork to a community of artists and supporters for free. Canvas, sketches, sculpture, fiber arts are all welcome. Love, art and poetry is what it's all about so come be a part of this rare creative endeavor. Please send your jpgs or links, email and phone to wickedlovelyfilms@gmail.com no later than Saturday 11:59PM. We could not have a poetry festival without an old-fashioned poetry contest! The submission procedure is simple. Where does poetry live in your life? In your shoes? In your garden? In your teacher? In a memorable meal? We really want you to be creative here, so do not write about it residing in a book! First: Identify where poetry resides in your life. Second: Write a poem, any style you wish! Please write the title of your poem, followed by your name at the bottom and contact email. Here's an example: Where does poetry reside in your life? Only three poems will be chosen! Contest submissions are due by August 20th. GUESS THE SECRET VENUE CONTEST! That's right! On August 28th, Poetrypalooza will be celebrating its GRAND FINALE NIGHT! But where? What city? Who's performing? We can't tell you anything, but we'll give you some clues to make it exciting! Across the course of the tour, we're inviting everyone attending to guess the SECRET GRAND FINALE NIGHT venue, location, and musical performance. Obviously, we wouldn't make it so SECRET if it wasn't so enormous in poetic proportions! Starting August 19th, we will be sharing poetical riddles on our Poetrypalooza Facebook page and here under the Contest tab. You have to guess the VENUE, LOCATION, and MUSICAL GUEST. Each night, the clues will be different. Send us your submissions to poetrypalooza@gmail.com with "Secret location" and your name in the subject line. The first three people to guess all three correctly win an Official Poetrypalooza Tour 2011 Prize Package! We hope you're excellent cunnundrumists! SECRET VENUE CLUE #1--AUGUST 19th--? SECRET VENUE CLUE #2--AUGUST 20TH--? Across the pages, inspiration grows. SECRET VENUE CLUE #3--AUGUST 21ST--? Life, art, words, music, and cafe. SECRET VENUE CLUE #4--AUGUST 22ND/23RD--?